Good morning and welcome back. Here's a list of organizations helping victims of Hurricane Michael. Hurricane Michael made landfall in Mexico Beach, Fla., as a high-end Category 4 storm early Wednesday afternoon, killing at least two people and causing catastrophic damage. It's the strongest such storm on record to hit the Florida Panhandle and one of the strongest ever to strike the continental U.S.
Electricity losses: As of 6am this morning, there were 359,306 accounts without power, according to Florida state officials. Per CNN, add that to losses in Georgia and Alabama, and the total number of customers without power is over 500,000. Oil-and-gas: Evacuations of Gulf of Mexico oil-and-gas platforms led to 42% of Gulf oil production and 32% of gas production being shut-in as of midday yesterday, according to the Interior Department. However, the storm path was east of most offshore energy infrastructure and, as S&P Global Platts noted, that production should be restored pretty fast. The big picture: There's lots of good info in our Axios Science stream about the unusual and dangerous storm. 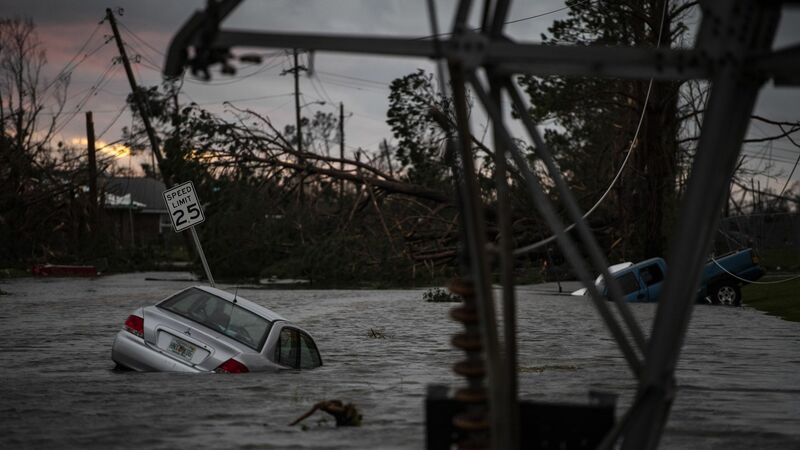 It hit the Florida Panhandle with the third-lowest atmospheric pressure of any storm ever to hit the continental U.S. (919 millibars), and was among the five strongest storms by sustained winds at landfall (155 mph). Axios' Amy Harder scooped yesterday ... Ernest Moniz, who was President Obama's DOE secretary, is suspending his involvement in a high-tech project in Saudi Arabia until more info is available about the disappearance and possible assassination of Saudi journalist Jamal Khashoggi. Where it stands: Moniz says he was invited to join an international advisory board for the development of NEOM, a planned $500 billion futuristic industrial city focused on tech sectors including energy. “In particular, I have been asked to offer guidance on achieving zero net greenhouse gas emissions. Success with this vision will have global implications for a low-carbon future,” says Moniz, who now heads the nonprofit Energy Futures Initiative. NEOM is part of the Saudis' effort to diversify their oil-dependent economy. Google released a report yesterday describing an interesting challenge: It aims to eventually use carbon-free electricity to power its energy-thirsty data centers around the clock and around the world. Why it matters: The tech giant announced months ago that it already purchases enough renewable energy in the aggregate to match their annual power consumption. But that's not the same thing as never using carbon-emitting power. Their data centers across the world are still pulling from grid mixes that contain varying amounts of fossil fuels. "On a global and annual basis, our purchases of solar and wind energy zero out the entire carbon footprint of our electricity use," they note. "Yet this is an imperfect solution. We want to build a future where each Google facility is always matched — around the clock — with carbon-free power," the study states. Where it stands: Google notes they source CO2-free power in two broad ways — their long-term power purchase deals from regional renewables projects and the power coming from a broader regional grid. They're now measuring how the hourly power use for each data center lines up with the hourly carbon-free supply in a given region (which bounces around due to the variability of renewables). One example is a data center in Hamina, Finland, where 97% of the power use is matched on an hourly basis with CO2-free resources, thanks to their wind purchase deals in the region and a Finnish grid with lots of nuclear, hydro and biomass. Yet at a center in Lenoir, N.C., the total is 67%, due to drawing on a night-time power mix in which energy from their local solar purchase deal has, of course, waned. And, at a Taiwanese center in a coal- and gas-dominated area, the hourly match is less than 20%, though they're hoping to begin directly sourcing CO2-free power thanks to recent changes in power market policies. "Policy and market reforms" can be enacted that lower procurement barriers, as well as carbon pricing. Develop and deploy technologies like advanced nuclear, storage and carbon capture. "[N]ew energy contracting approaches that focus on providing firm low-carbon electricity 24x7." Elon Musk is disputing a widely circulated Financial Times report that James Murdoch, the outgoing CEO of 21st Century Fox, has emerged as the top candidate to replace Musk as the chairman of Tesla. "This is incorrect," Musk said on Twitter last night. Why it matters: Per Musk's settlement with the SEC for the fateful "go private" tweet, Tesla has until the middle of November to replace Musk as chairman of the company. Murdoch joined Tesla's board last year. Quick take, via Axios' Felix Salmon: Musk seems determined to continue to violate the spirit, if not the letter, of the SEC agreement. First with his “shortseller enrichment commission” tweet, and now with the appointment of his friend James Murdoch as an “independent” chairman, if the report is true. "It’s unclear whether he meant it was incorrect that Murdoch was the 'lead candidate' as The FT reported, or that it was incorrect that Murdoch was in consideration at all." Dallas Fed's latest Energy Indicators report reveals the expanding use of the largest type of tankers to handle growing U.S. crude oil export volumes from the Gulf Coast. VLCC stands for "very large crude carriers," which can handle up to 2.5 million barrels. Approximately 289 million barrels (bbls) were exported via water in the first half of 2018, up 237 percent from the first half of 2017, according to ClipperData. If the average daily export volume observed in July and August were held constant through year’s end, U.S. water-borne exports would grow another 62 percent year over year in the second half of 2018. What's next: Via the Houston Chronicle, "U.S. crude oil exports are expected to more than double by 2020 and, unlike the pipeline constraints hampering the growth of the booming Permian Basin oil field, the Texas Gulf Coast will be ready to ship the larger volumes to the world, according to two studies released this week." EPA: Via Bloomberg, "The Environmental Protection Agency has installed new members on a scientific advisory panel that guides the agency on air pollution — and only one of them is an independent, academic scientist." OPEC: Per Reuters, "OPEC Secretary-General Mohammad Barkindo said on Thursday that oil producers are very concerned about spare output capacity amid a reduction in energy-industry investment, with crude prices rising recently on fears of a drop in Iranian supply." BMW and EVs: AP reports, "German automaker BMW is taking a majority stake in its China joint venture and investing 3 billion euros ($3.5 billion) in factories there, underscoring the importance of the Chinese market as the company prepares to meet increased demand for electric vehicles."